Timothy Weidner, the distinguished head of the Chapman Museum, will be our guest speaker on July 25th. He will present a wonderfully illustrated talk on the work of the famous photographer Seneca Ray Stoddard around Lake George. Seneca Ray Stoddard had a varied career as a student of the Adirondacks. He was a naturalist, writer, artist, cartographer and photographer and his work not only educated the country about the beauty of this area but helped create interest in protecting it through the creation of the Adirondack Park in 1892. Based in Glens Falls for much of his life, Stoddard carried a 50 lb camera throughout the Adirondacks and the Chapman Museum has an extensive collection of his work. 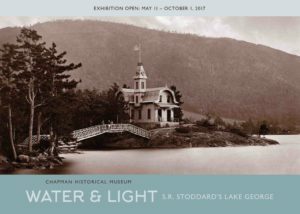 Their show, “Water and Light” gathered his photographs of Lake George and inspired a book by that name. The Chapman’s book will be available for purchase and proceeds will benefit both our organization and the Chapman.